The Karachi Marriage Halls Association on Saturday announced that wedding halls across the city will be closed from Sunday, January 27 in light of notices issued by the Sindh Control Building Authority (SCBA) on the Supreme Court orders. The Supreme Court on January 22 barred the use of residential houses for commercial purposes. "Wedding halls, shopping malls and plazas will not be constructed on residential plots," SC's Karachi registry ordered. The court had also ordered that all encroachments across the metropolis should be immediately razed. “The buildings which are not part of the master plan should be demolished. The city should be restored to how it was 40 years ago. No matter how many buildings there are, they should be demolished," Justice Gulzar Ahmed said. Following the Supreme Court’s orders, SCBA sent notices to fifty per cent of the districts in Karachi's east and center to halt all commercial activities. According to officials, SCBA is scheduled to begin its anti-encroachment operation from January 28 (Monday). 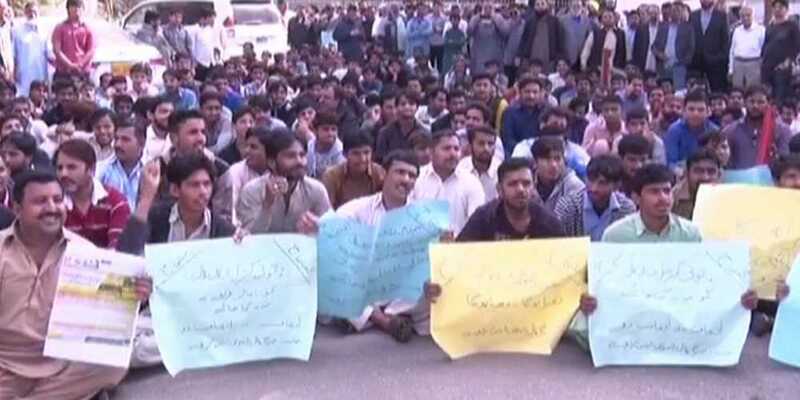 Members of the Karachi Marriage Halls Association staged a protest outside SCBA’s office located in Civic Centre today after the received the notices. “We were given a three days’ notice. Where are we supposed to work?” the protesters asked. Further, president of the Karachi Marriage Halls Association said they will close down wedding halls from Sunday.